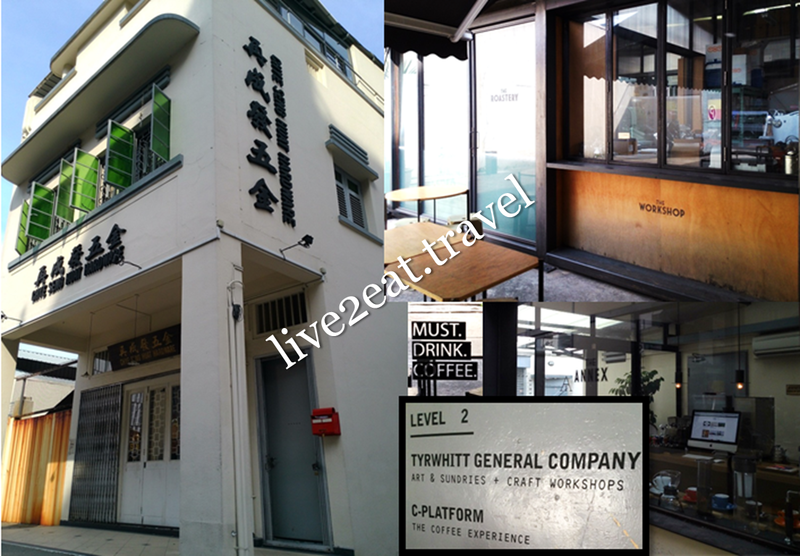 After lunch at Antoinette, I decided to walk to Chye Seng Huat Hardware (CSHH) located along Tyrwhitt Road. Thought it was not opened for business until I saw people opening a heavy metal door beside the metal gates, so I followed them in and was surprised by the world of difference inside. 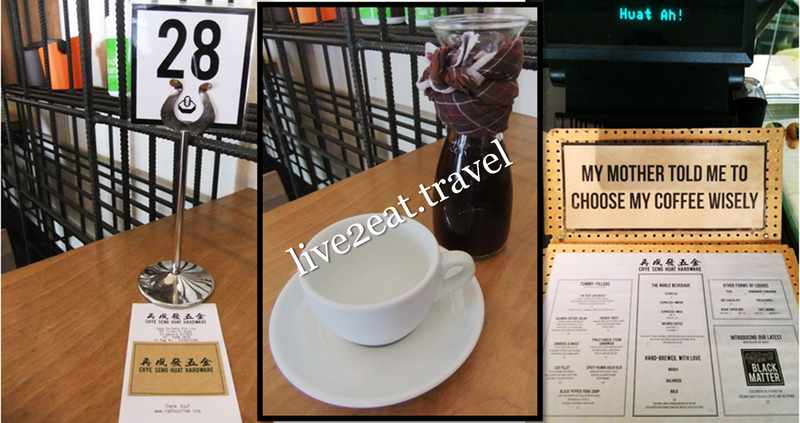 Occupying the 1st floor of the three-storey shophouse is CSHH Coffee Bar with an island bar in the middle of the main room, behind which is private coffee tasting room Annex. Across this, and housed at the back, is the roastery that scientifically brings out the best intrinsic flavours of coffee. On the 2nd floor is Tyrwhitt General Company and C-PlatForm with state-of-the-art coffee gadgets, apparatus and machines for coffee enthusiasts to understand and learn about coffee beyond the bean. Grabbed the last available table, a low one by the open metal shelf where apparatus and crockery are displayed with price tags. Was spoilt for choice with its coffee selection and asked for recommendations, to which the staff simply asked if I liked my coffee black or with milk. Since it was the former, she recommended the hand-brewed coffee and explained the different characteristics of the beans. Depending on the choice of beans, the coffee is prepared differently to extract its flavours. It can be steeped in hot water for about 1.5 minutes and plunged through the aero-press, or filtered and dripped through the v60. Oh, and did I mention the beans are carefully weighed and grinded upon order? That explains the 7-10 waiting minutes. As I was not seated around the bar, I could not really watch and interact with the barista as he meticulously prepared my order. While waiting, I looked around and noticed lots of wood and metal in its interior design, a reminder of the building's history. The name, which means to flourish again, was collaboratively conceived by the landlord and Papa Palheta to pay tribute to the heritage of the site and vicinity as the Jalan Besar district was home to several metal and hardware companies in the past. My choice of La Flor Del Café from Guatemala arrived in a flask with about two cups worth of coffee, a hot cup and a saucer. I could smell a faint aroma of roasted beans in my pleasant cuppa that was very smooth, a tad acidic and bitter with a sweet aftertaste on my tongue, and more medium than full-bodied. Whether or not it is worth the walk under the hot sun and its $6 price tag, I will leave that decision to you. And in case you need a bite, an all-day menu is available with a variety of baked goods as well.